Learn from a national wellness speaker and two neighborhood health programs during the 2016 Urban Wellness Summit Sept. 29. Keynote speaker Dr. Sharon D. Allison-Ottey, a noted health strategist, researcher and author, will provide practical advice, research and inspiring ways to create healthier neighborhoods. Presenters from the Center for Community Health, Foodlink and the Interdenominational Health Ministry Coalition will share videos and tips on replicating their successes. The summit is presented by the High Blood Pressure Collaborative, a partnership of the Greater Rochester Chamber of Commerce and Finger Lakes Health Systems Agency. Learn more. 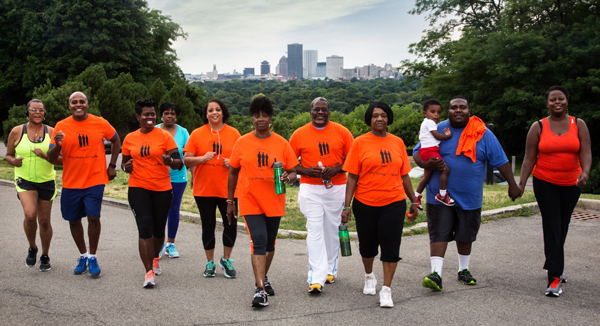 Pictured above: Members of In Christ New Hope Ministry Church meet twice a week to walk at Cobb's Hill. The church participates in Interdenominational Health Ministry Coalition, which will share its success stories at the Urban Wellness Summit. 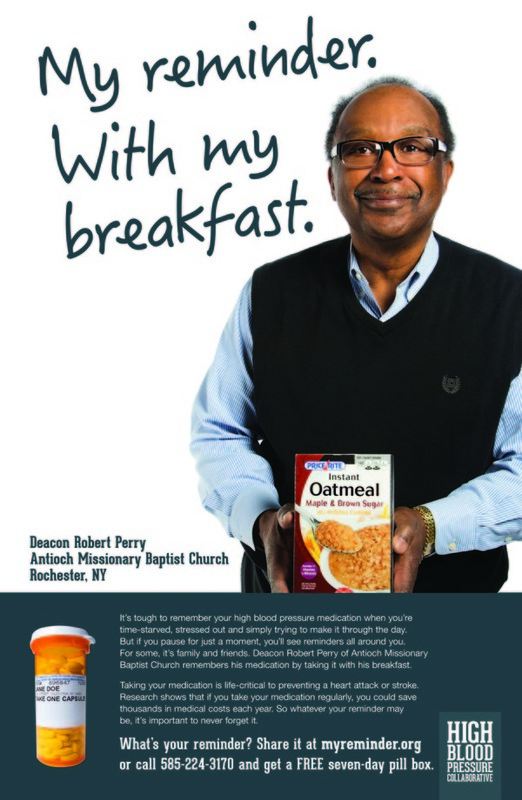 Deacon Robert Perry takes his daily medication with his breakfast. Vicki Brown uses a reminder app on her phone. Shirlyn Washington keeps her medication at home and at work, so that she takes her it with her first cup of coffee in the morning. Soon these health champions, along with more than 30 other community members, will share their medication reminders in full-color posters made exclusively for their congregations or workplaces. The customized posters are part of the High Blood Pressure Collaborative's My Reminder campaign, which encourages people to develop reminders that will make taking their medication a habit. Learn more. 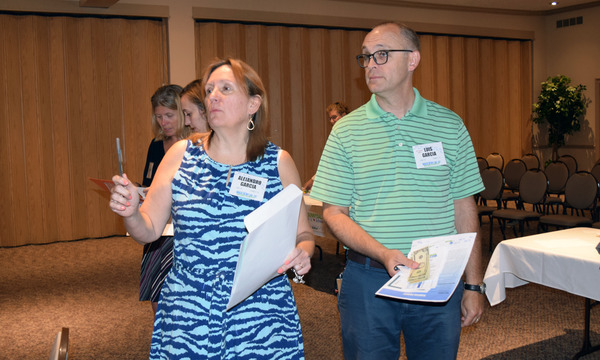 More than 50 people participated in the Rural Partners Poverty Simulation July 20, an immersive, role-playing experience that helps decision makers and service providers understand the challenges faced by residents with limited resources who live in rural areas. “Sitting on the other side of the table, so to speak, makes us think about what we are saying and how we are saying it,” said Jan Montanye Castillo, medical dental coordinator of the Geneseo Migrant Center. The simulation was presented by Finger Lakes Health Systems Agency, Coordinated Care Services Inc. and S2AY Rural Health Network. Read more. Pictured above: Jan Montanye Castillo and Causewave Community Partners President and CEO Todd Butler take part in the “Walk in My Shoes” Rural Partners Poverty Simulation. The Greater Rochester Chamber of Commerce and its High Blood Pressure Collaborative have earned multiple national awards, including this month’s innovation award from the Association of Chamber of Commerce Executives. More here; news coverage here. Join our team of innovation experts. We've created several new positions to meet our growing needs. We have openings for Information Technology Manager, Senior Research Associate, Program Administrator and Program Assistant. Get more details here. Share this message by e-mail.